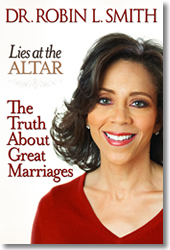 In Lies at the Altar: The Truth About Great Marriages, Dr. Robin Smith addresses the unspoken needs, unasked questions, outrageous expectations, and hidden agendas that often linger beneath the surface of the wedding vows–and later cause power struggles, suffering, feelings of hopelessness and failure in marriages. Lies at the Altar shows every couple how to take the wedding vows they made in earnest and in innocence, and turn them into a promise to build a happy, healthy, satisfying and long-lasting marriage. With moving stories and personal journeys, Dr. Smith reveals why it’s important to have one’s “eyes wide open” in a marriage; how to write true vows to live by; and why it’s never too late to rewrite your vows. Whether people are heading to the altar, suffering in an unhappy marriage, divorced, or simply want to bring more satisfaction and intimacy into their relationship, Dr. Smith shows couples how to create Truth—the secret ingredient of great marriages. If you are ready and willing to stop the merry-go-round of settling for less than your heart desires, and you want the reward of a secure and passionate marriage, Dr. Smith gives you everything you need to make the journey from acceptable misery to outrageous joy and satisfaction. LIE: Marriage is an automatic ticket to self-esteem. TRUTH: You have to be whole before you can be joined. LIE: You have to go along to get along. TRUTH: In a great marriage, you can ask for what you need without fear of reprisals. LIE: If the package is beautifully wrapped, its contents will be fabulous. TRUTH: The packaging doesn’t tell you anything about what’s inside. LIE: The past is over. TRUTH: The past is driving you to the chapel. LIE: Anything is better than being alone. TRUTH: Being alone and free is better than being together and controlled. LIE: It’s important to be right. TRUTH: It’s more important to relate. LIE: You can learn to live with compromises that trouble your soul and make you suffer. TRUTH: Suffering is not love. TRUTH: You can’t have a great marriage if you live in a bunker. LIE: If you believe in the same God, you’ll share the same values. TRUTH: Values are what you live not what you believe. LIE: Marriage magically changes people for the better. TRUTH: The person at the altar will be the person at the breakfast table.